Made from a breatheable linen/cotton blend, the Sheraton Luxury Linen & Cotton Quilt Cover Set (King) has the relaxed, lived-in softness of a well-worn shirt. Enjoy the tactile texture of linen and the softness of cotton to create a warm, modern atmosphere where you sleep. 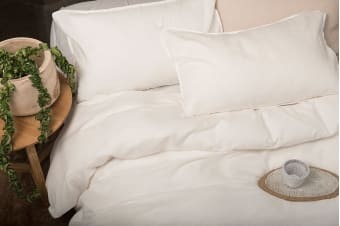 The Sheraton Luxury Linen & Cotton Quilt Cover Set (King) is luxuriously soft, breathable and comfortable and will continue to soften over time.